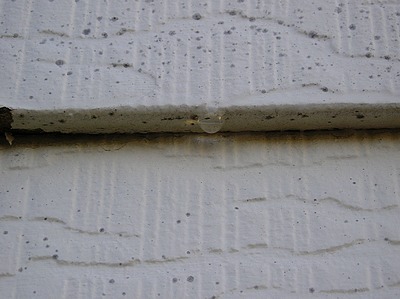 Mold on Masonite lap siding. Occasionally cleaning mold from an existing painted surface is necessary. You may not want to repaint yet. Or in many cases, you really don’t have to. In situations like this turn to the much milder household cleaner, hydrogen peroxide is a good choice. Or you can use one of the many oxygen cleaners that are available. Many products claim to be gentle on many finishes. Always play it safe. Test any product that’s new to you on a spot that’s less visible. While paint isn’t all that expensive, the time it takes to repaint is valuable. Who needs a cleaning job to lead up to a painting job if that can be avoided? Apply some of the cleaning solution to a small inconspicuous area according to the manufacturer’s directions and see if the original paint is affected. If it is, either use a weaker solution and test again, or don’t use the product. It’s a general safe practice to test a cleaning product with your paint before washing a large area. 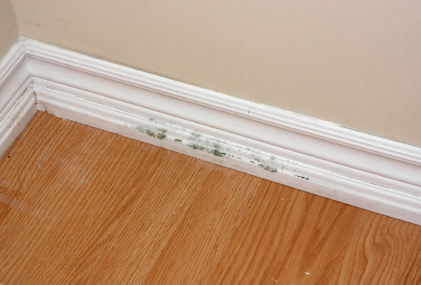 While cleaning mold, your may find the growth is bad enough that bleach seems like the best choice. If you choose to use bleach never use more than 1 cup of bleach to 1 gallon of water. Always test the compatibility of this concentration on a small section first. Use caution and care when working with any chemical, especially bleach. When using a spray bottle beware of the fine mist it produces. If you breathe it in, it will irritate your lungs no matter what solution you have in the bottle. Never mix bleach with ammonia or acidic cleaners. The toxic gas these combinations produce could kill you, or leave you with seriously compromised lung function for life. A chemical respirator is recommended. It will protect your lungs from mold spores and from any chlorine gas released as the bleach reacts with the mold and mildew.